Well its that time of year again folks, farm dinner season is upon us! I have been moving about the central coast and once again find myself working with Outstanding in the Field. The culinary circus kicked off their public tour a couple of weeks ago and we have been galavanting in some of the most pristine pockets of California. The days are long in the hot sun where we set our tables but I have remained grateful for my time in these magical places. The long drives, heavy lifting and as my pedometer recently informed me, an average walk of over 10 miles during service, keeps me fit and the food we serve, leaving me inspired. Our first week brought us to the rolling hills of Pescadero, to a 6th generation cattle ranch called Markegard Family Grass Fed. The family farm is home to a substantial herd of Belted Galloways that graze on the otherworldly 6,000 acres of preserved coastal pastures. I had just finally got around to finishing one of my required California readings, The Grapes of Wrath and the novel gave words I could never find to the breathtaking landscapes of California. 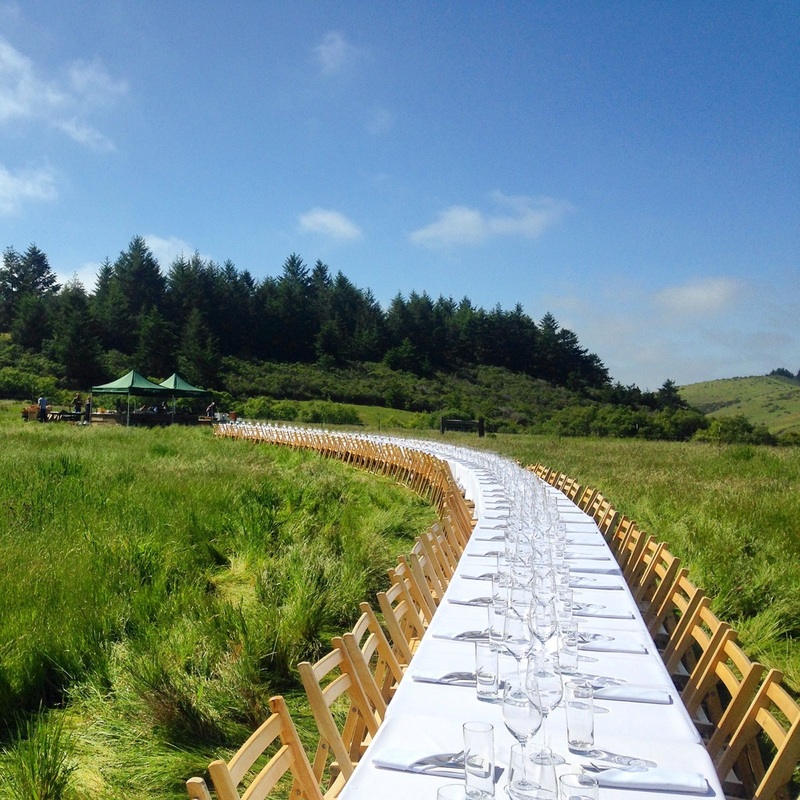 As we set the table in the pastures of Pescadero, I stare into the hills and remember Steinbeck's words, "The full green hills are round and soft as breasts". Springtime has leant itself to wildflowers, spring onions, lamb and strawberries littering our menus and the hot days are soon blanketed with thick fog coming off the Pacific and the cool breeze has me craving hearty stick to your bones food. In a cast iron skillet over medium high heat, sear the sausages. Once browned, add the onions and cook for 5 minutes. Add garlic and scapes and sauté until hot. Add the wine and deglaze the pan. Add chopped fava beans. Cook for another 5 minutes and serve. Top with fresh chèvre, olive oil and salt and pepper. I took some time to venture to San Francisco with a girlfriend and as we drive up the iconic Highway 1, I beheld the raw coastline that no matter how many times I drive along it, still leave me breathless. We bopped around San Francisco, relishing the ethnic food that is somehow void in Santa Cruz, admire the architecture and I slept on my friends fire escape in her camping hammock. Awoken by the sun we head to my favorite boutique Japanese knife shop Bernal Cutlery to cash in my free sharpening I earned last year, leaving me itching to practice knife techniques in the kitchen. Cook soba noodles to packaged instructions. Place noodles in serving bowls. 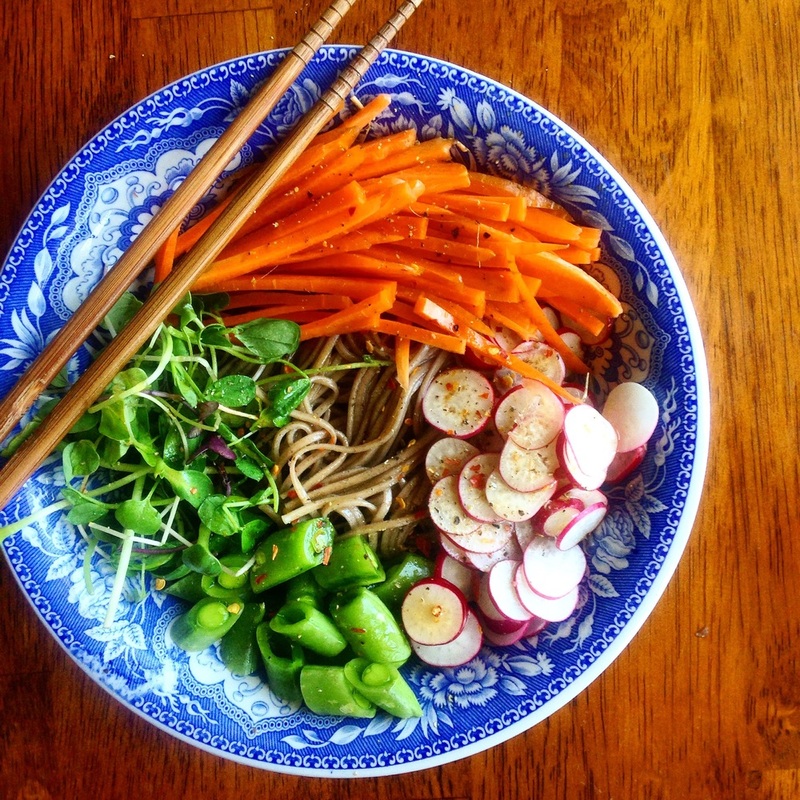 Place peas, radish, carrots and micro greens in little bundles atop of the noodles. Drizzle sesame oil, soy sauce and vinegar over top. Season with chili, salt and pepper. Serve immediately or top with broth. Add a poached egg if you're feeling frisky! 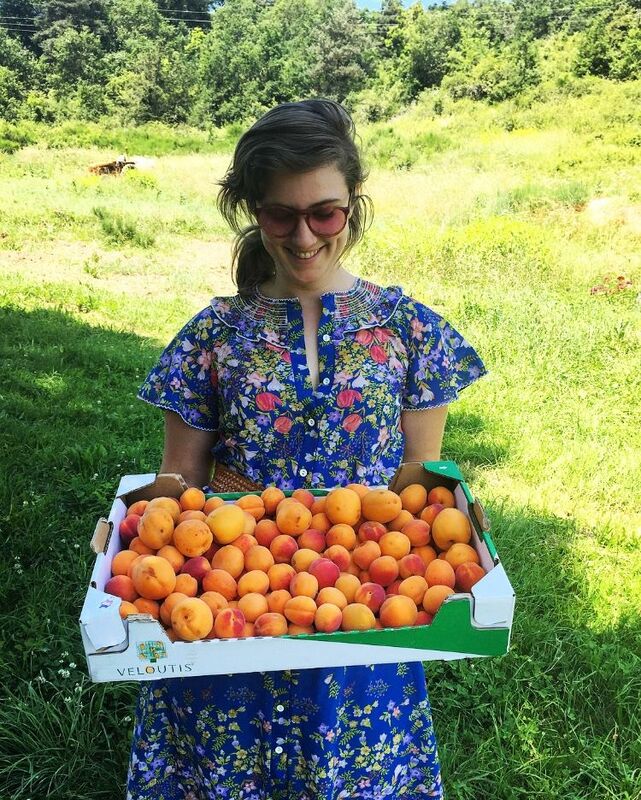 I then found time to stage with the infamous Pickle Girl of Felton, Emily Eder at the Cremer House and learned some of the tricks of her pantry. We broke down 20 pounds of carrots and reminisce about our days at Camp Joy. I am lucky enough to make off with one of her legendary recipes. In a large mason jar intermittently layer carrots, dill, garlic, and seasonings. In a medium sauce pan combine Apple Cider Vinegar, water, sugar and salt. Bring to a boil. Remove from heat and pour over carrots. Keep in fridge for a week and enjoy for up to a month. If canning, prepare jars and store to packaged instructions. 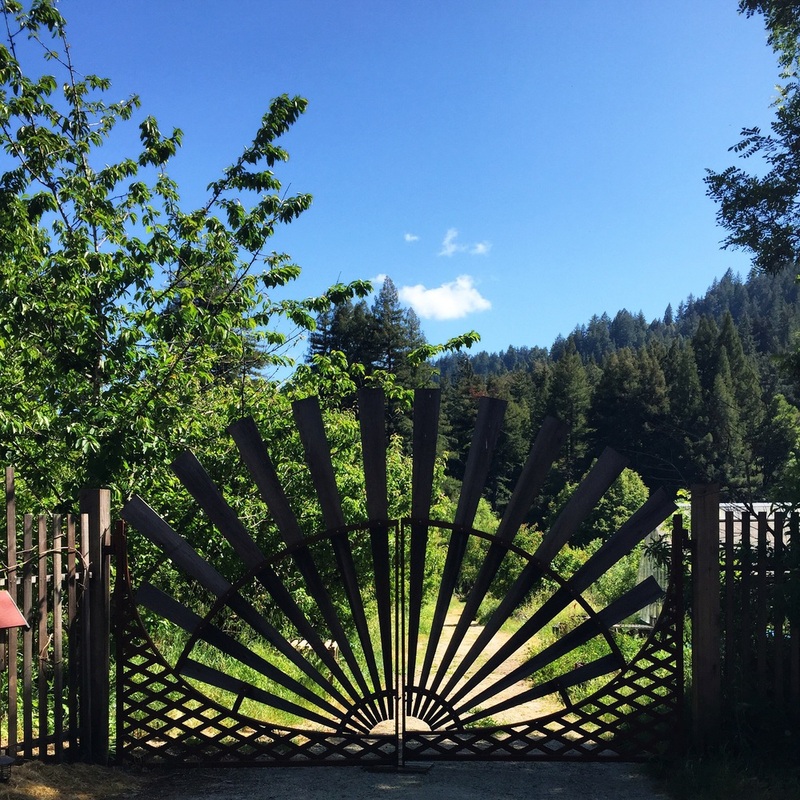 The Outstanding tour soon moves north into Petaluma and the hills become grander and more immense and we watched the cattle parade home for feeding and milking. Steinbeck's dreamy white farm houses of California echo in my mind at Dolcini Ranch. Doug Dolcini a 5th generation rancher whose family has been on the land since the 1870's, took a shine to me after we shared a beer on his porch and talked raising animals for slaughter. The ranch has seen many hands and I wonder about the family that has defended, shepherded and protected this land and moved it for over a 140 years. The fog cooled our bones and David Retsky of County Line Harvest who leases land from the Dolcini's for vegetables offered us his insulated yurt, complete with a fire place and outdoor kitchen. We rest for the night, all 12 of the crew packed into the tiny yurt, giggling with joy that we do not have to brave the chilly night. We awake with the fog and cook a feast of last nights leftover rabbit meatballs topped with Kitty Dolcini's pastured eggs atop. It is Mother's Day and we all take time to make contact with our mamas and thank them for brining us to this beautiful earth. Combine flour, salt, sugar and lemon zest in a large bowl. Add butter pieces and work into a coarse meal, so the butter turn into roughly the size of a pea. Add water to ricotta and knead into dough. Make a ball and wrap in plastic. Flatten into a disc. Chill for at least an hour. Wash & clean berries and rhubarb. Hull berries and slice in half, set aside in bowl. Chop rhubarb into 1/2 inch pieces and place in the bowl with the berries. Cover with sugar and stir. Set aside for a minimum of 2 hours or overnight. When the juices are released from the fruit pour into a large skillet over medium heat. Bring to a rapid boiling, stirring often for about 10 minutes or until the juice is thick. Remove from heat. Preheat oven to 400 degrees. On parchment paper roll out dough until about a 1/4 of an inch thick. Cut into pentagon shape. Lay strawberry rhubarb mixture atop of dough and gently fold dough around filling. With a pastry brush, brush yolk mixture on outside of pastry and sprinkle with sugar. Bake at 400 degrees for 30 minutes or until golden brown. Cool & enjoy! I then find myself in Healdsburg, California in Sonoma County, land of Olive Oil and Fine Wine. I hang my hammock in the tree tops along the Russian River and serve Miyagi Oysters to thrilled guests at Front Porch Farms. I relish the biodynamic plants that are perky and abundant at Preston Vineyards and we serve dinner amongst the 60 year old grape vines that produced the fermented juices I am pouring into guests glasses, directly in front of them. I arrive back to Santa Cruz exhausted from the back to back dinners and find myself hosting a potluck of young, ambitious, healthy farmers who have all decided to gather at my house. We throw together whatever we please and the dinner is impressively cohesive. Deanna's Salade Niçoise steals the show with its hearty & salty nourishment. 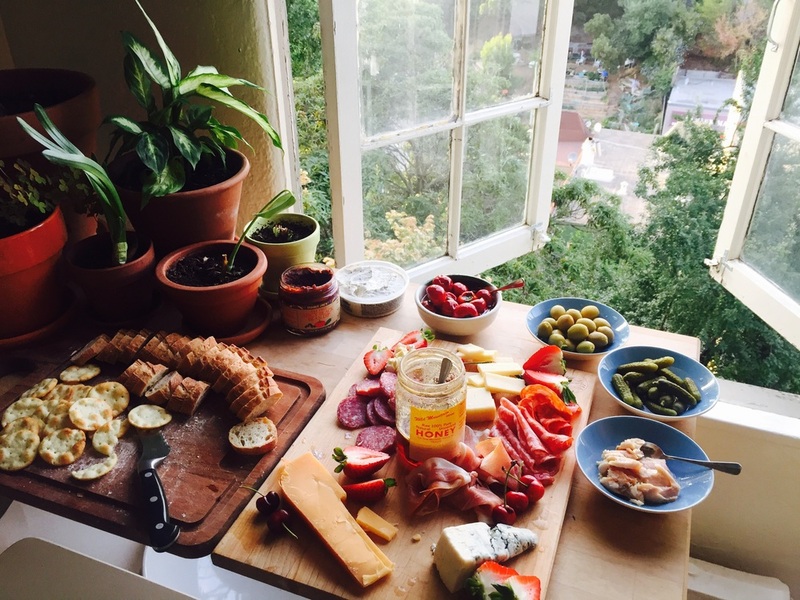 I fall into a deep slumber and awake to the Pacific Ocean out my window and am once again grateful for my community and the beautiful food that seems endlessly abundant in California. Combine all ingredients and shake together in mason jar. Set aside. In a large salad bowl, lay salad greens. Lay anchovies, potatoes, hardboiled eggs, radish, beets, and olives atop. Dress with vinaigrette and toss. Serve immediately.